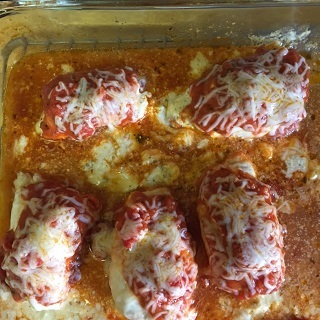 With little more than your favorite spaghetti sauce (we used a sauce made with cream and vodka – from the Whole Foods Market), cream cheese and a shredded Italian cheese blend, you can have yourself some chicken roll-ups. They are super easy to prepare. 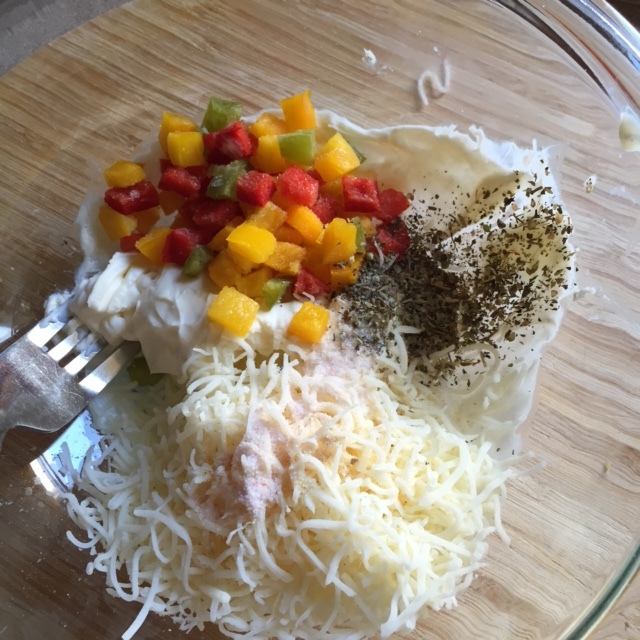 In a medium bowl mix cream cheese, ½ cup of cheese, bell pepper, oregano, garlic and salt to taste. When we salt in our recipes, it is always use Himalayan salt. After you mix up the ingredients, set aside. 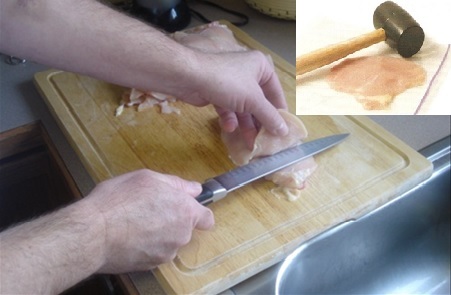 Cut chicken long ways across breast. Place each cut chicken piece one at a time in a large plastic bag, seal it and with a rubber mallet or rolling pin flatten chicken to ¼-inch thicknesses. At one end of chicken strip roll up with cheese mixture, tucking in ends around filling to completely enclose the filling. Place seam sides down in 13 x 19 inch baking dish coated with olive oil. Pour spaghetti sauce evenly over chicken, and cover with aluminum foil. Place in preheated oven and bake for 30 minutes or until chicken is cooked through. Remove foil, sprinkle chicken with remaining ½ cup shredded cheese. Bake an additional 3 to 5 minutes or until cheese is melted. 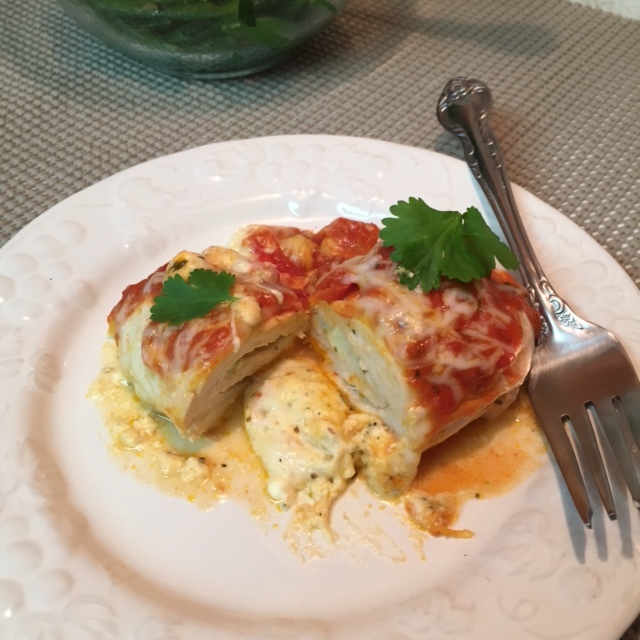 Plate and enjoy your Italian Five Cheese Chicken Roll Ups with a salad or your favorite vegetable. 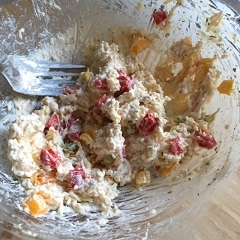 This entry was posted in Chicken, Main Dish and tagged Baked beans, Baked Eggs with Tomatoes, Baking, Barbecue chicken, Bell pepper, Casserole, chicken roll ups, Chili pepper, Chili powder, easy recipes, Herbs and Cream, Italian cheeses, Italian food, Stuffed peppers, Tomato. Bookmark the permalink. I love making a stuffing for chicken breasts – so delicious. Lots of good things in your stuffing. These look great. Gotta love an easy dinner! Thanks Amber, and yes, easy and simple, including healthy recipes are the way to go! !